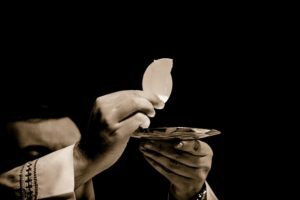 This service, also known as the Eucharist or The Lord’s Supper, goes right back to Jesus who on the evening before his death took bread and wine, blessed it, and gave it to his disciples. He told them to repeat this as a way of remembering him. The bread and the wine act as powerful reminders of Jesus’ death on the cross at Calvary, which we understand was a sacrifice in our place, a ransom so that we could be released from the power of evil that has this world in its grip. Throughout the centuries, Christians have found that through this ceremony, Jesus seems to come closer and give spiritual strength. All who are sincerely seeking to follow Jesus are welcome to come up and receive the bread and wine. If you would prefer not to do this, you may like to come up to the front, keeping your hands down, and allow the priest to pray for God’s blessing on you. If you prefer to stay in your seat, that’s fine too! If at any point during the service you are not confident to join in, – please just relax and listen to what is going on around you. We hope that you will sense something of God’s presence, that you will know his love for you, and will go out strengthened and encouraged for the week that lies ahead. Communion also reminds us of the miracle when Jesus fed 5,000 on the hillside overlooking Galilee, using just 5 loaves and 2 small fishes. 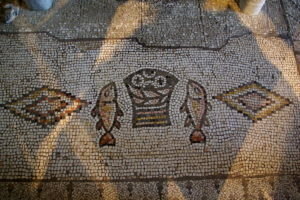 That event is commemorated in the mosaic floor of a chapel at Tabgha which is illustrated below.